It’s time to Stuff the Bus. We are collecting our Stay Alive Five at the Union Community Church, Saturday, October 13 from 9 am to noon. Please help us stuff the bus with: Hats (winter) Coats (adult sizes L – 4xl) Gloves Boots (Men’s Size 9 – 13) Sleeping bags Other items We take ONLY NEW Socks please. Tents Hand warmers PLEASE: No pants. No dresses. No undergarments. No toys. 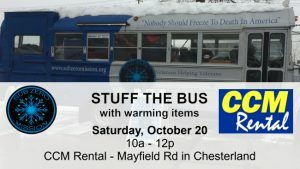 The good folk at CCM Rental on Mayfield Rd in Chesterland will help us Stuff the Bus. Saturday, October 20 from 10AM to Noon. 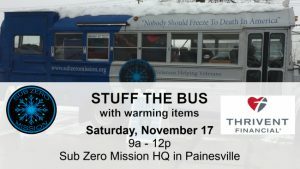 Please help us stuff the bus with: Hats (winter) Coats (adult sizes L – 4xl) Gloves Boots (Men’s Size 9 – 13) Sleeping bags Other items We take ONLY NEW Socks please. Tents Hand warmers PLEASE: No pants. No dresses. No undergarments. No toys. We are collecting our Stay Alive Five at St. Gabriel Church in Mentor Sunday, October 21 from 10 am - 1 pm. This collection is part of an Eagle Scout Project. 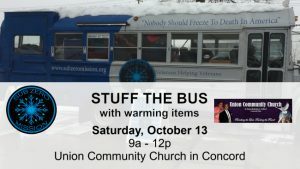 Please help us stuff the bus with: Hats (winter) Coats (adult sizes L – 4xl) Gloves Boots (Men’s Size 9 – 13) Sleeping bags Other items We take ONLY NEW Socks please. Tents Hand warmers PLEASE: No pants. No dresses. No undergarments. No toys. Catch 22 Tattoo, 1505 Madison Ave.
We are collecting our Stay Alive Five at Catch 22 Tattoo in Painesville Sunday, October 21 Noon to 4P/ Please help us stuff the bus with: Hats (winter) Coats (adult sizes L – 4xl) Gloves Boots (Men’s Size 9 – 13) Sleeping bags Other items We take ONLY NEW Socks please. Tents Hand warmers PLEASE: No pants. No dresses. No undergarments. No toys. Western Reserve Harley Davidson, 8567 Tyler Blvd. It’s time to Stuff the Bus. We are collecting our Stay Alive Five at Western Reserve Harley Davidson in Mentor Saturday, October 27 10A to 3P. Please help us stuff the bus with: Hats (winter) Coats (adult sizes L – 4xl) Gloves Boots (Men’s Size 9 – 13) Sleeping bags Other items We take ONLY NEW Socks please. Tents Hand warmers PLEASE: No pants. No dresses. No undergarments. No toys. Stop for the wings. Help us Stuff the Bus. 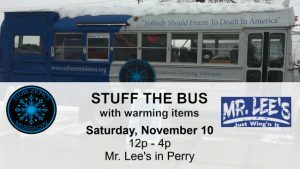 We are collecting our Stay Alive Five at Mr. Lee's in Perry, Saturday, November 10, 12P to 4P. 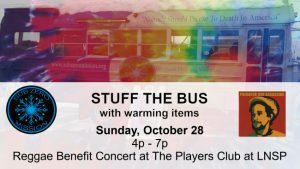 Please help us stuff the bus with: Hats (winter) Coats (adult sizes L – 4xl) Gloves Boots (Men’s Size 9 – 13) Sleeping bags Other items We take ONLY NEW Socks please. Tents Hand warmers PLEASE: No pants. No dresses. No undergarments. No toys.